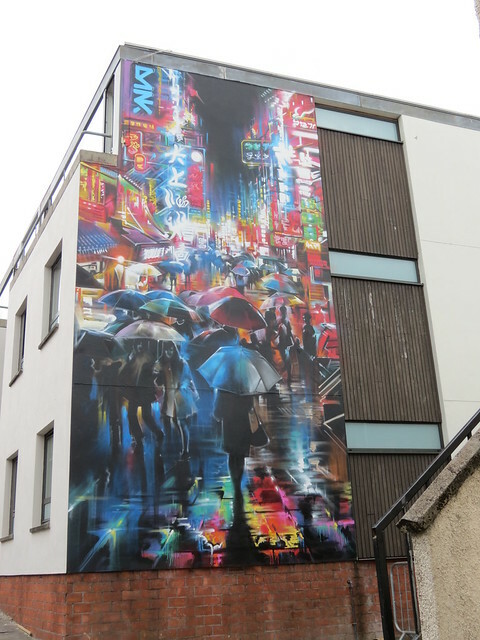 Dan Kitchener is my favourite street artist – I just adore his work! 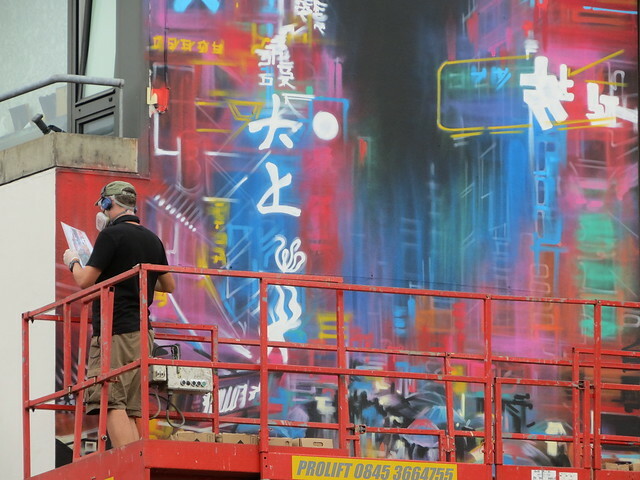 He produces a lot of Japan-inspired work, mainly featuring geisha and the neon streets of Tokyo. If I ever won the lottery I would buy a piece of his work, or better yet commission him to paint something for me! 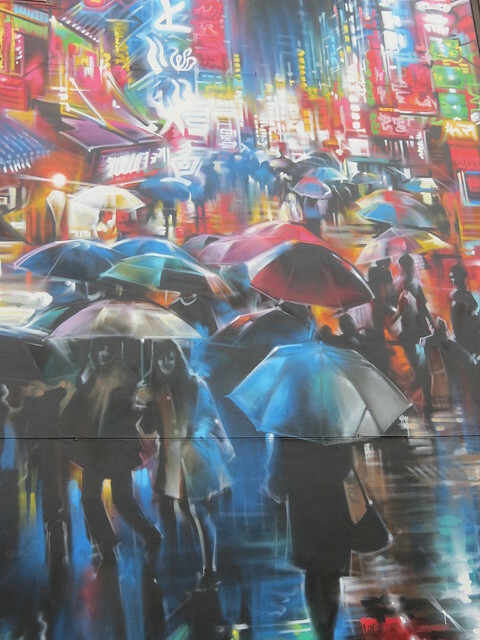 At this year’s Upfest Dan Kitchener painted this massive rainy Tokyo street scene, which I love. Miss Wah’s work is all about kawaii (cute), and she even has her own ‘Shades of Kawaii’ adult colouring book, which I’d love to get my hands on! 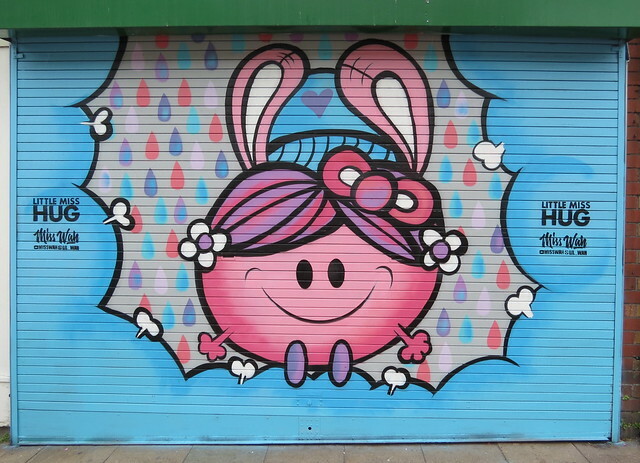 Her street art is in the style of illustration, and her characters are really cute. 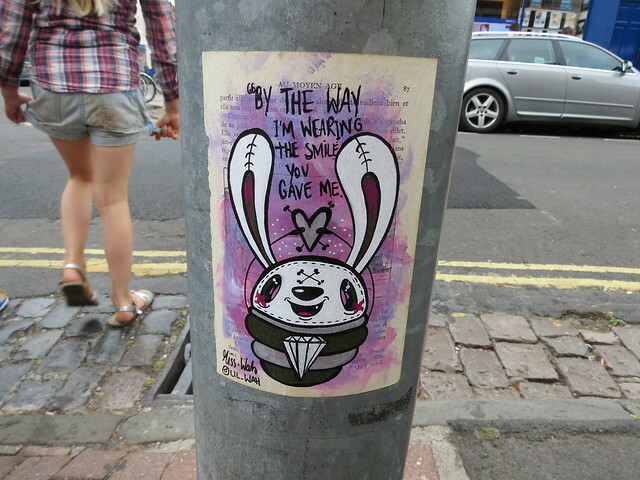 Like Miss Wah, Hoshiko’s work is pretty cute and includes graphic design and illustration as well as street art. 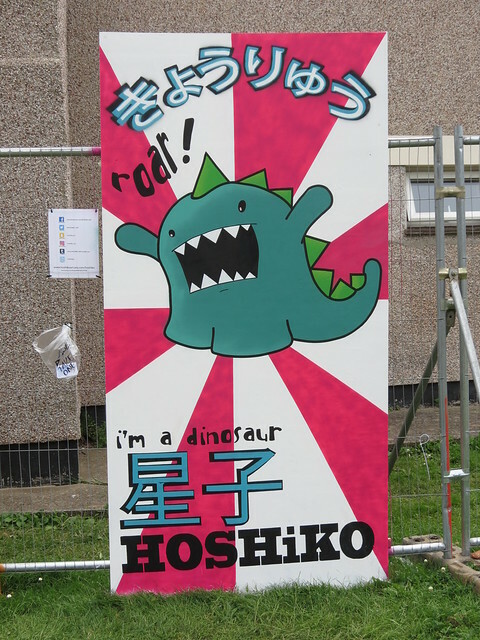 She uses Japanese words in her art, like this piece which says きょうりゅう, meaning ‘dinosaur. 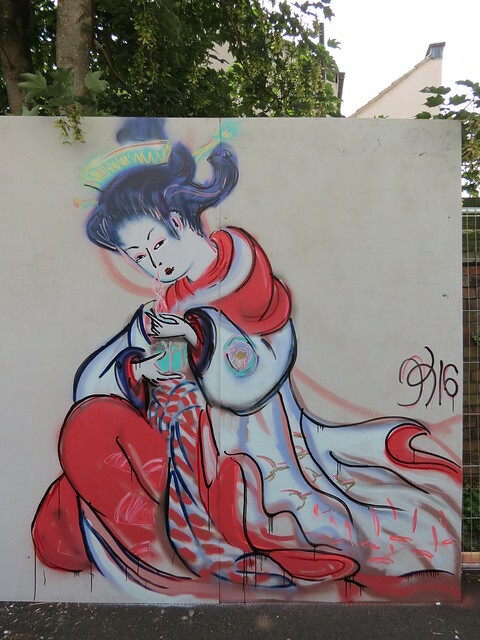 I also spotted a geisha or oiran (courtesan), but I’m not sure who it was by. I like the lines in this piece, and the colours. 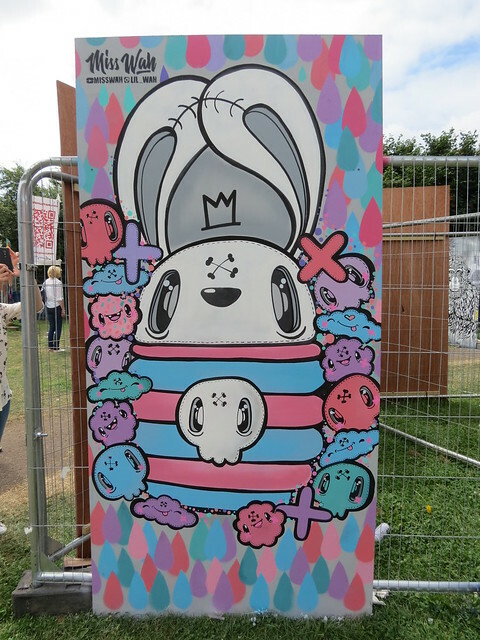 I love to see people taking inspiration from Japan in the art they produce, and having these works of art created in my home town is brilliant! Bristol is a great place for street art and creativity. 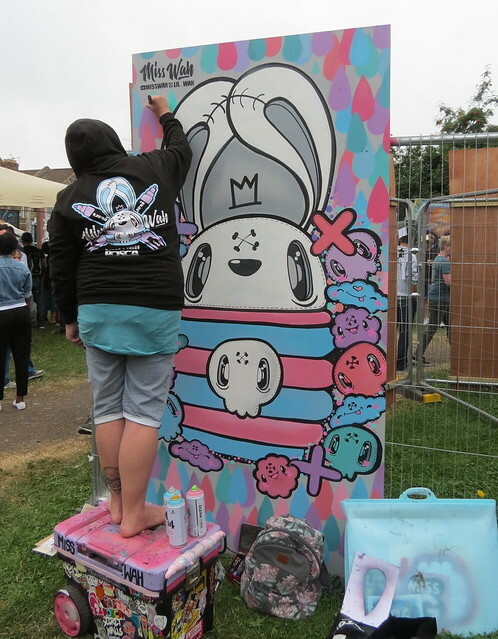 Upfest usually takes place yearly – keep an eye on their website for announcements about the 2017 festival. Hey Ali, thanks for the blog post! This reminds me of a French graphic designer/illustrator called Tsuchinoko. His work is deeply influenced by Japanese culture and there’s a cool video of him doing street art in Japan on his site. Btw, I’ve been trying to find a way to contact you. I’m not sure if the contact form works and I can’t find an email on your blog. Can you please drop me a line? Thanks! I got your message – thanks. I can be a bit slow to reply sometimes – sorry! I’m lucky enough to live right next to one of his artworks here in London, which I can see from my balcony and whenever I leave the house. It used to glow at night, thanks to black light, but somehow they stopped it. Anyway I’m glad to have stumbled onto your blog, loved your article about Naoshima.